This is the third in a trilogy of Ileana Dresses for Lulu. This time, I decided to frankenstein it together with the Lotta Dress, which I have been dying to make for ages. 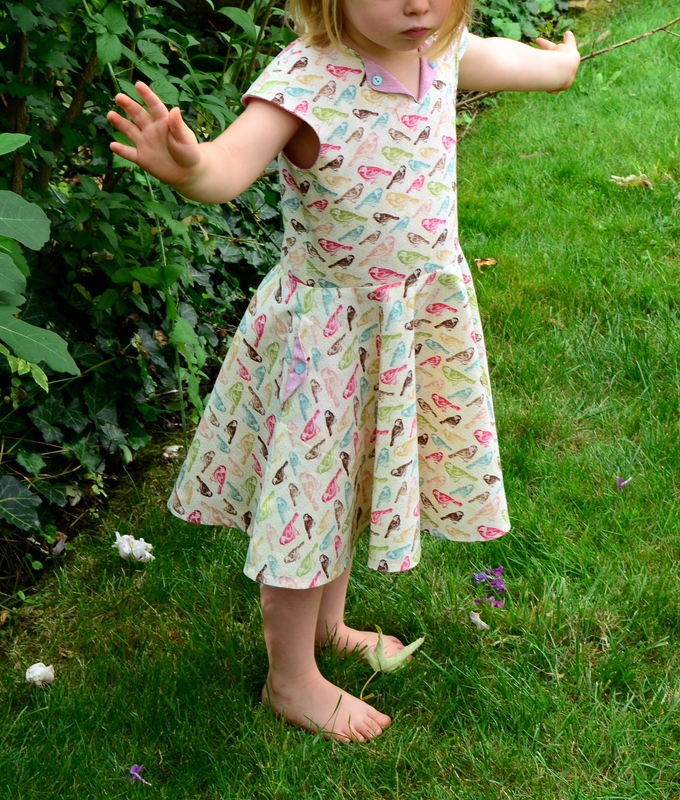 Both the Lotta and Ilena Dress patterns are from Compagnie M — and the coolest thing about them is that the bodices, skirts and sleeves of all Compagnie M’s dresses can be switched around from pattern to pattern. All the pieces fit together without any finagling at all! I should mention here that one of the benefits of being a Compagnie M super fan is that I’ve become an affiliate. My goodness, how official! 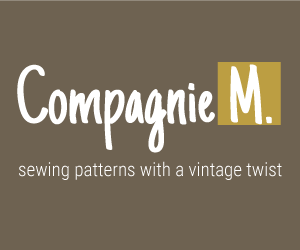 I’m pretty excited about being in cahoots with Compagnie M — thanks for having me, guys! 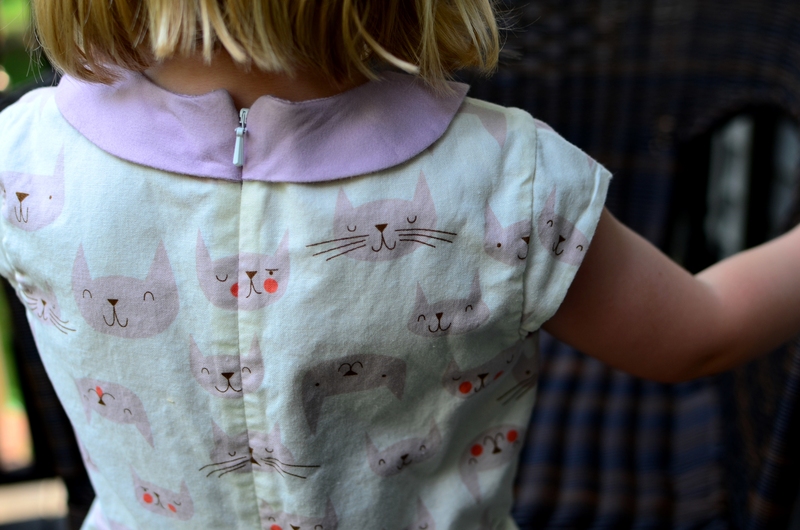 Anyway, I’ve looked longingly at the Lotta Dress neckline with the little buttons since the pattern was released, but I was worried that Lulu wouldn’t wear it due to the lack of twirly-ness in the skirt. But now that the Ileana has arrived with its circle skirt, the problem is solved! 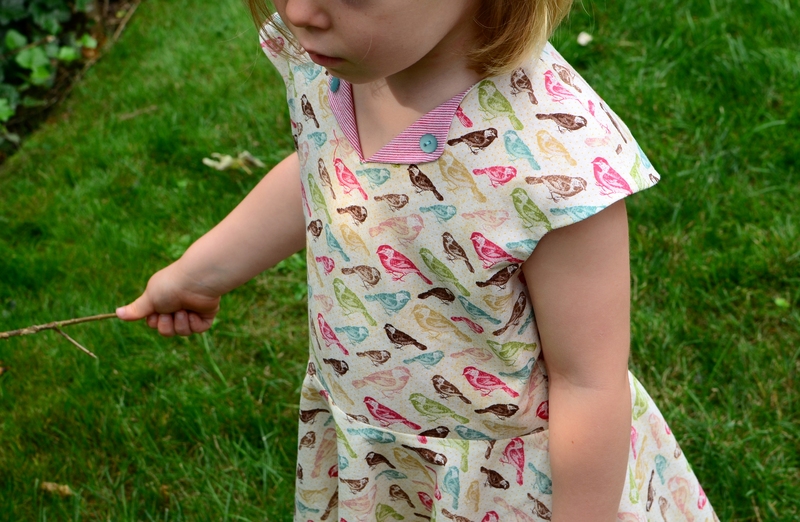 The bird fabric is from Joann’s. I bought it about three years ago and used it for a couple of projects in my early days of sewing. I loved it so much that I bought more and have been sitting on it all this time. The lining is red/cream striped shirting from my local fabric store that I originally intended to use for myself. But it goes together with the birds so well, I couldn’t help but use it. 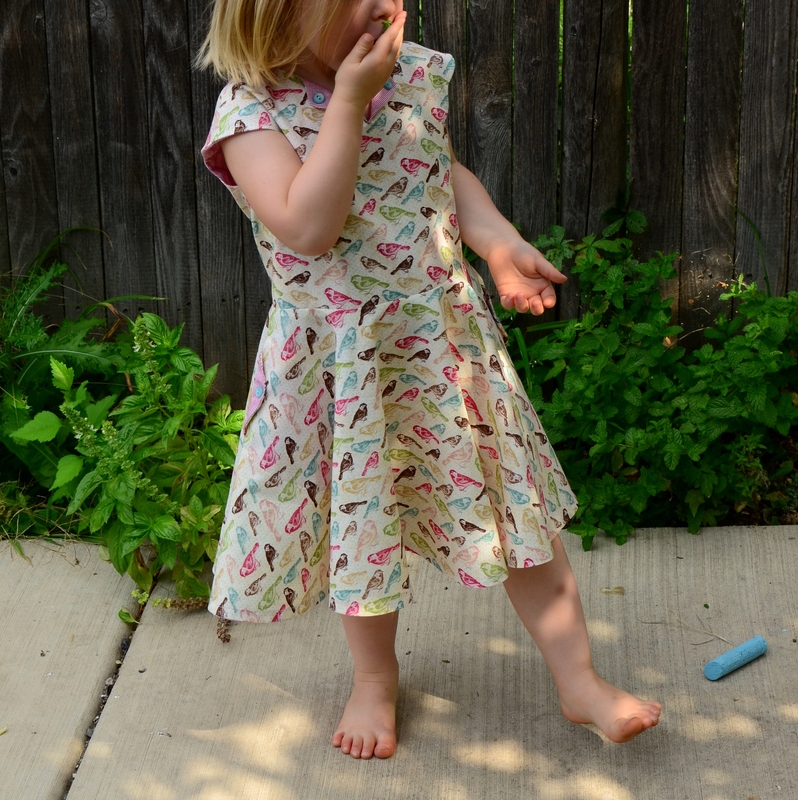 I decided to use the side seam pockets from the Lotta pattern. I figured they’d work best with the circle skirt without getting in the way. 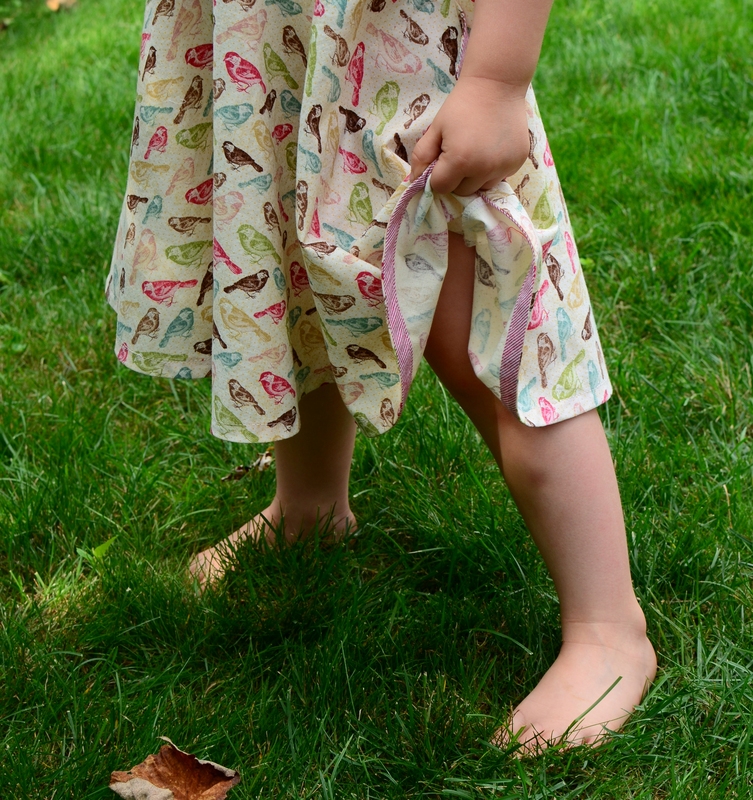 As I did with Lulu’s other two Ileanas, I stitched the entire pocket onto the front of the skirt, which keeps everything together during twirling and such. I used the lining fabric to make bias tape for the hem — an extra step that was well worth it, especially since I have my trusty bias tape maker which makes the pressing quick and keeps my fingers from getting singed too much. 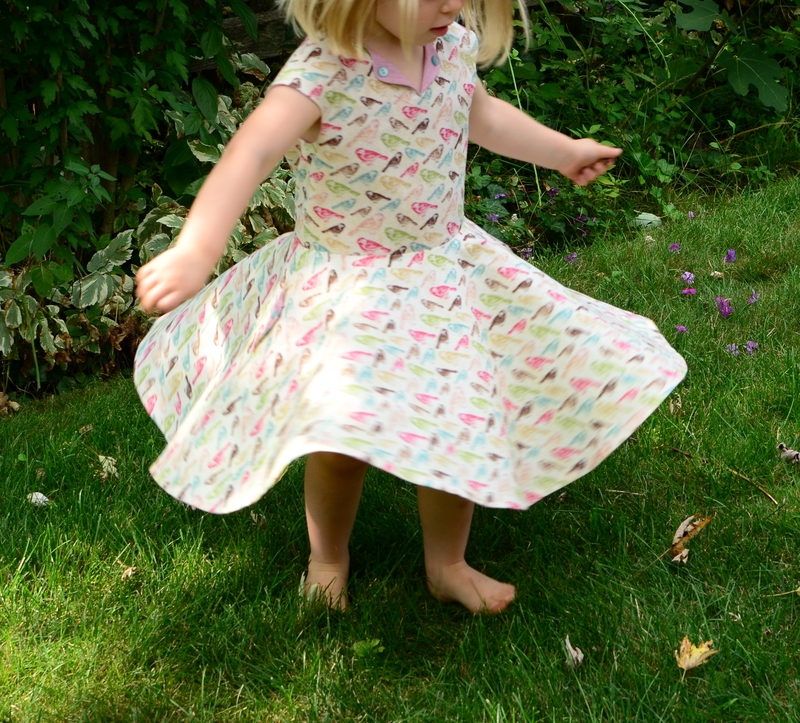 In the pattern instructions, Marte warns against using directional fabrics for the circle skirt option, as the print will be sideways at the side seams. I thought long and hard about this before I started on this trilogy of dresses and considered using the half circle skirt instead. 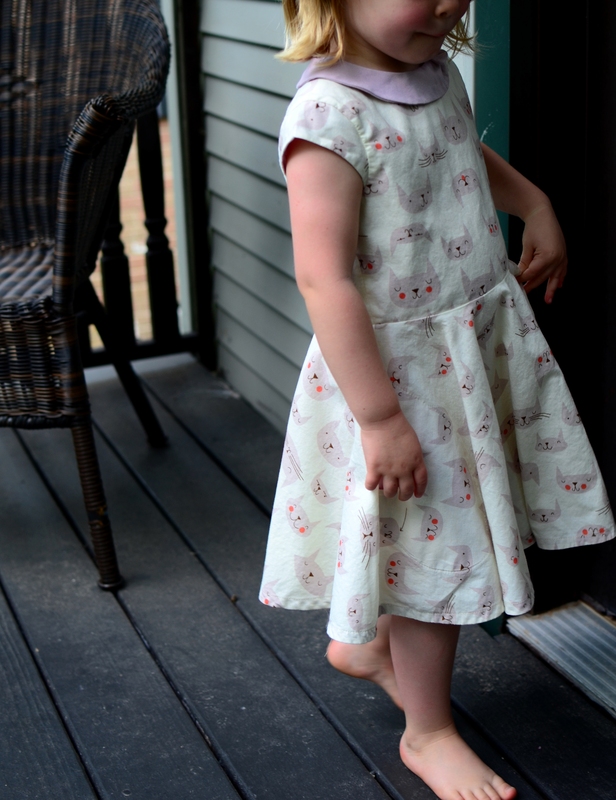 But I knew that if I really wanted Lulu to love these dresses, I had to go full circle — print wonkiness be damned. I stand by that decision (and I really don’t think anyone would notice if I didn’t point it out, right??). 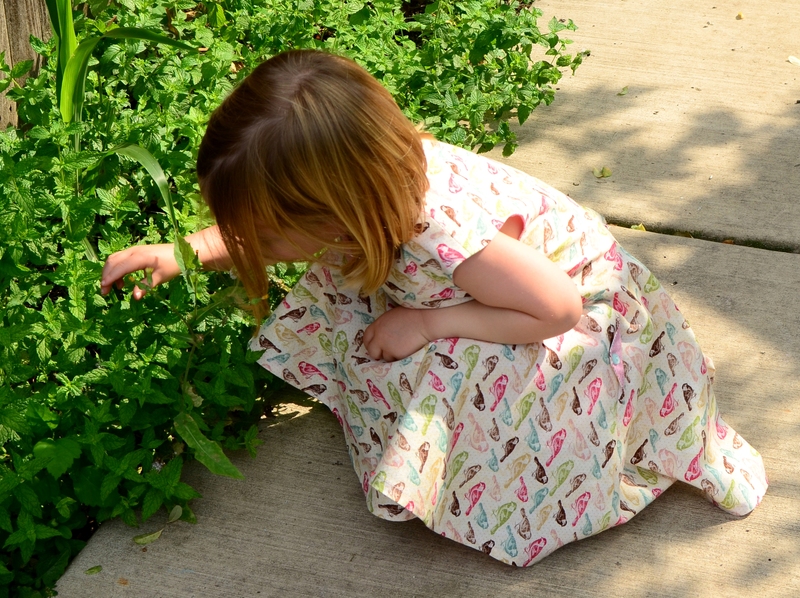 This dress turns out to be perfect for enjoying the last of the summertime mint in the back yard . . . I bought this completely awesome kitty fabric almost two years ago and have been waiting for just the right project for it. Well, the day finally came . 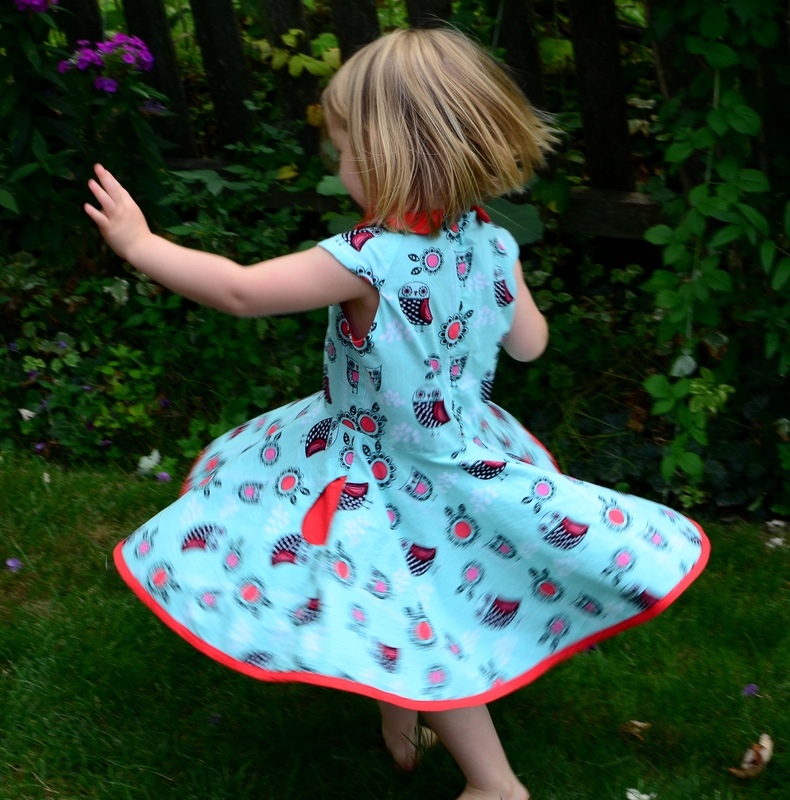 . . and here it is as an Ileana Dress (from Compagnie M)! 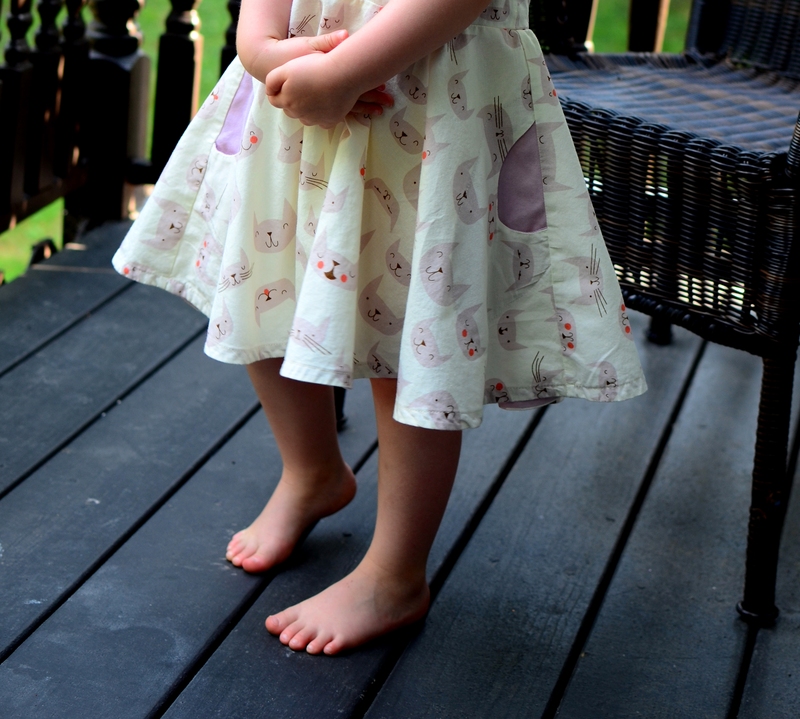 This is my second of three Ileana creations for Lulu — the child who will wear only circle skirts. Her skirt requirement is a little limiting, but I can think of worse things. I’ve already declared my love for this pattern here, but it bears repeating. 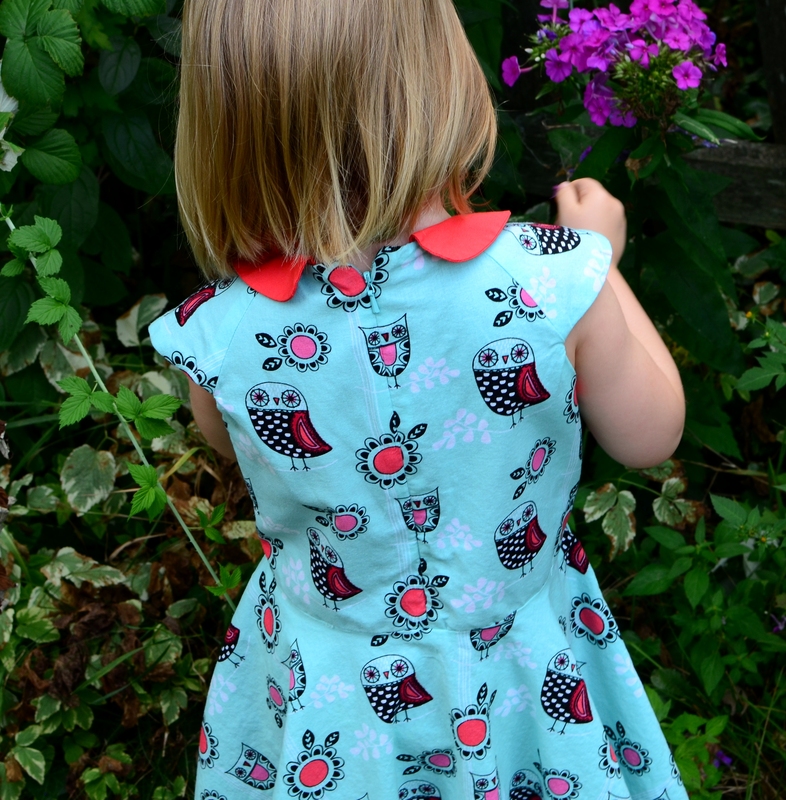 This pattern is wonderful and has so many options that it can be made into many very different dresses. For this version, I chose the bow collar. Isn’t it chic? 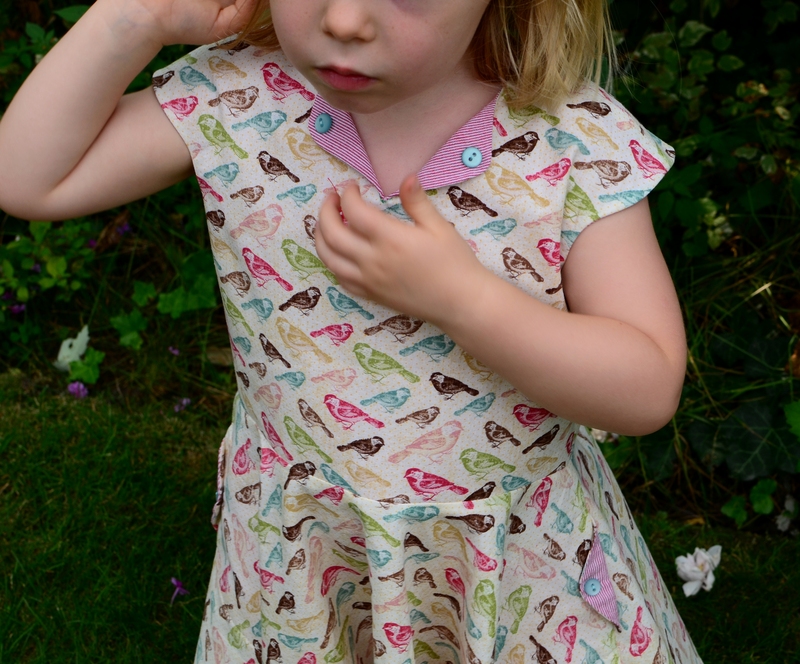 The other options I picked are the capped sleeves, full circle skirt (of course) and the tear drop pockets. Um, Mom, did you say pockets? 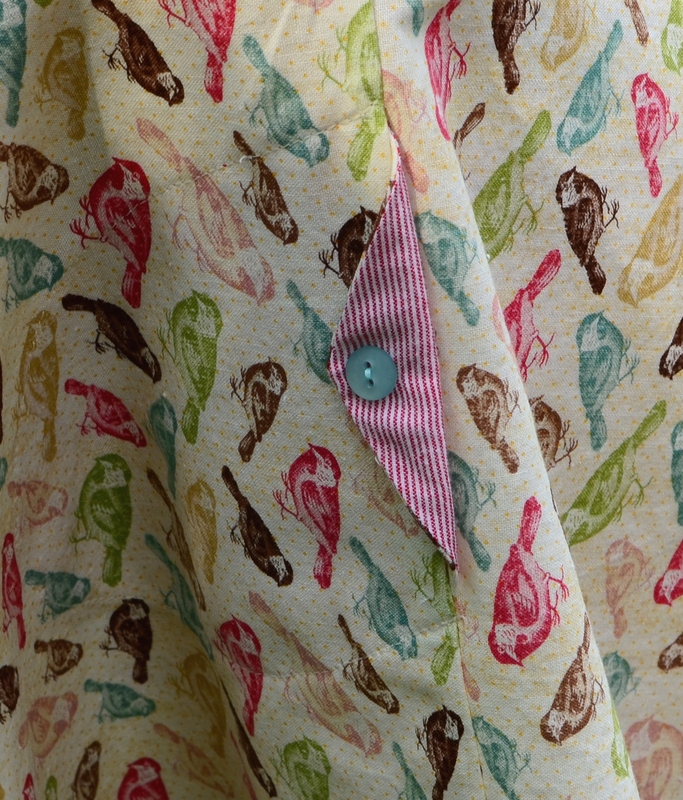 As I mentioned before, these pockets are extremely simple to make and look darn fabulous. As I did in my first Ileana, I stitched the entire edge of the pocket onto the front of the skirt so that it won’t flop around while twirling. When searching my stash for contrast fabric, I happened to find an old duvet cover stuck in there in the perfect shade of lilac. 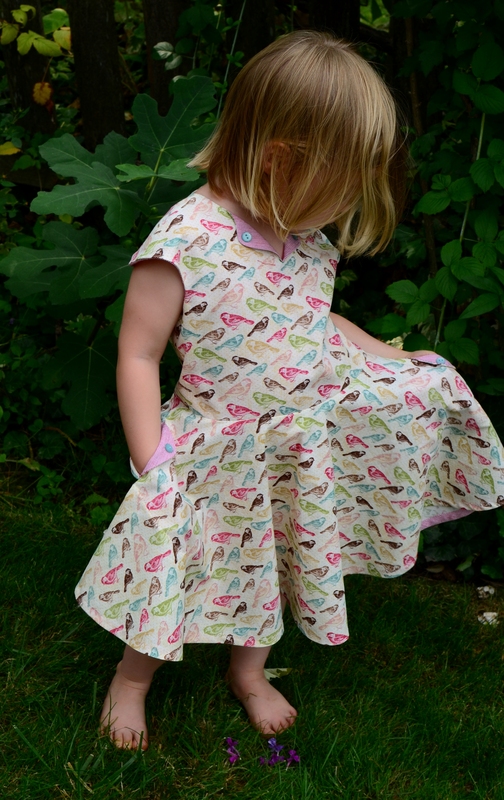 It was a pretty nice duvet cover with a high thread count, so this dress now has a luxuriously soft lining and collar 🙂 And there’s plenty of fabric leftover for several other projects. Huzzah! I finally realized that I have an invisible zipper foot. I found it in the bag with all the other feet I got when I bought my new sewing machine over a year ago — haha! It makes a real difference. But one thing I had to learn the hard way is that while the invisible zipper foot is perfect for sewing the zipper tape very close to the main fabric, it’s better to use a regular zipper foot when you sew the zipper into the lining. If you use the invisible zipper foot for both the main and lining fabric, the zipper gets sewn in too tight and you won’t be able to move it up and down. Ugh. It’s a fixable problem, but unpicking a zipper is a pain! 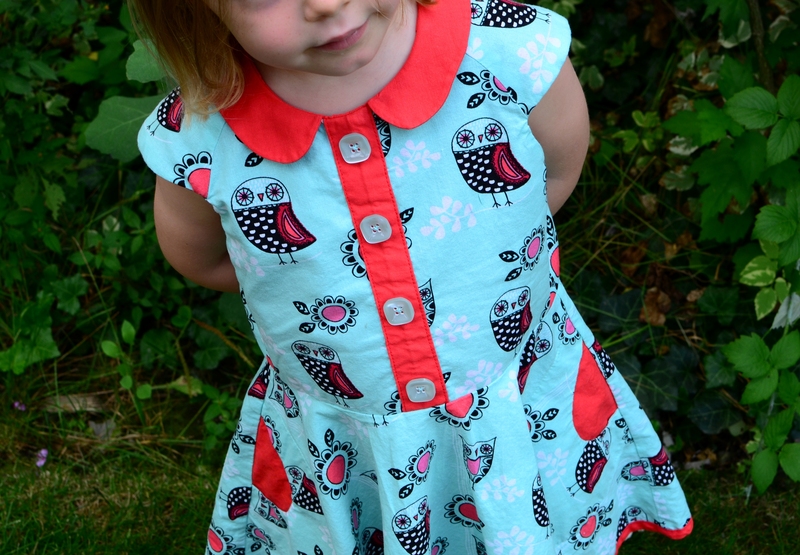 Lulu is having a blast wearing this dress all around town. 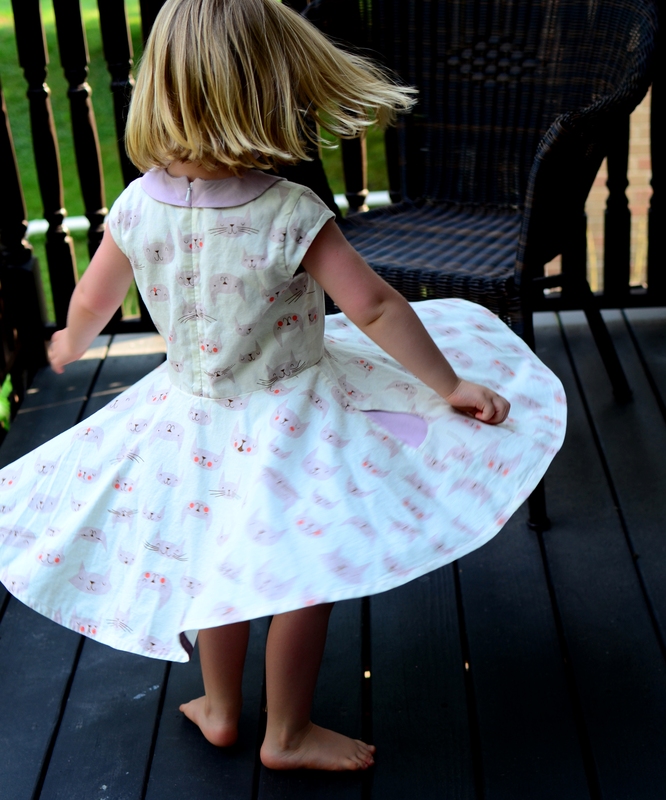 Isn’t it nice when your kid loves her new dress as much as you do? Great news! 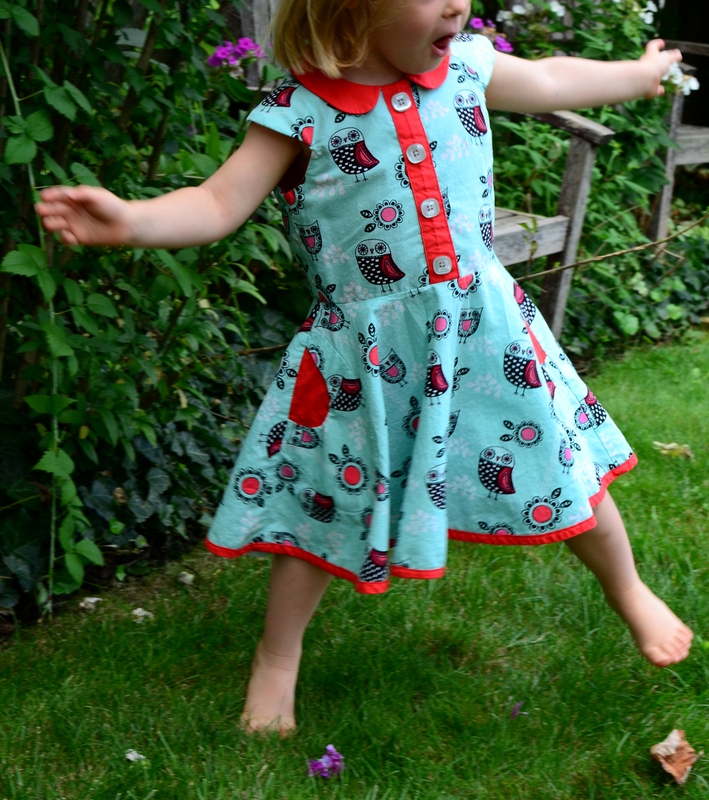 There’s a new pattern out from Compagnie M — the Ileana Dress. 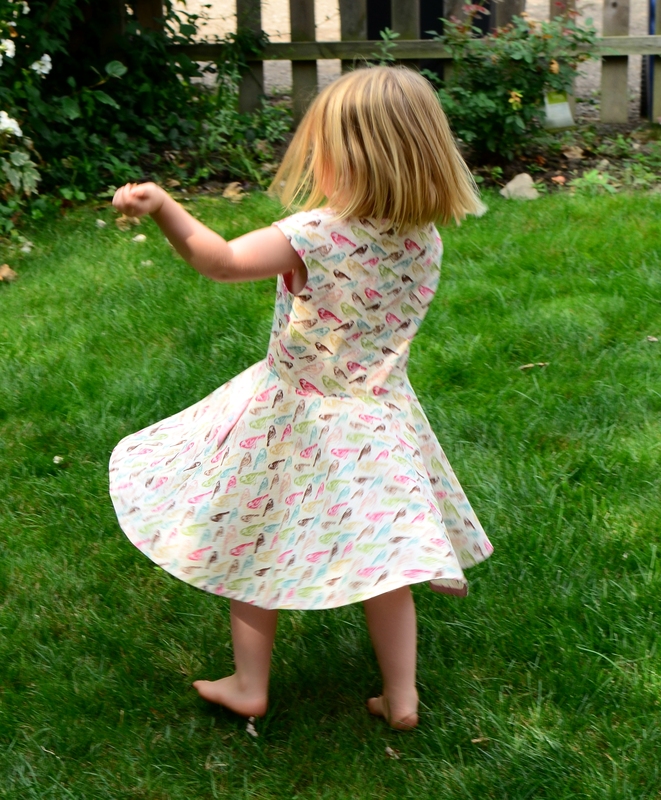 If you’re like me and you have a kid who will wear only dresses that twirl, this pattern is for you. 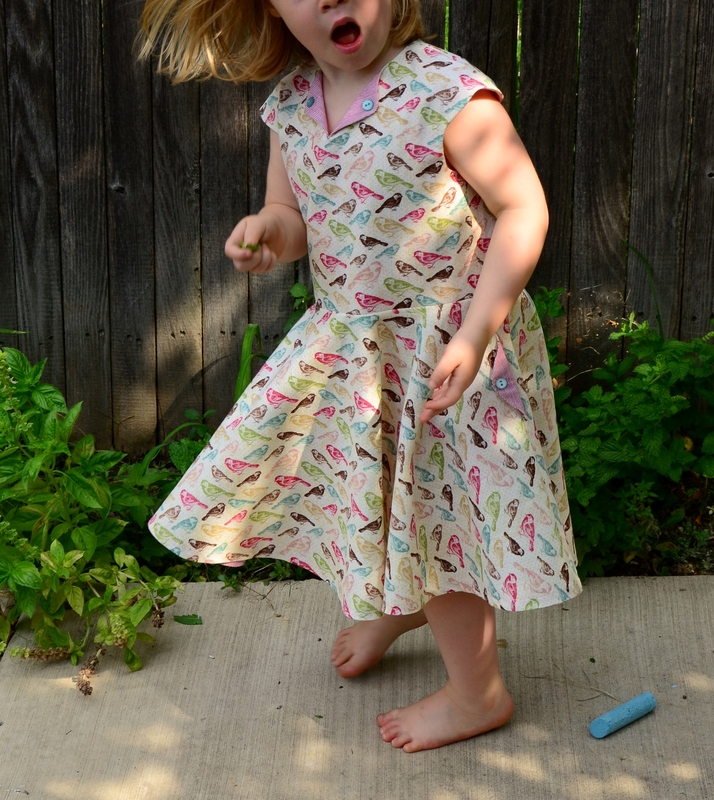 The Ileana has tons of options, so you can make a whole bunch of unique dresses from this one pattern. 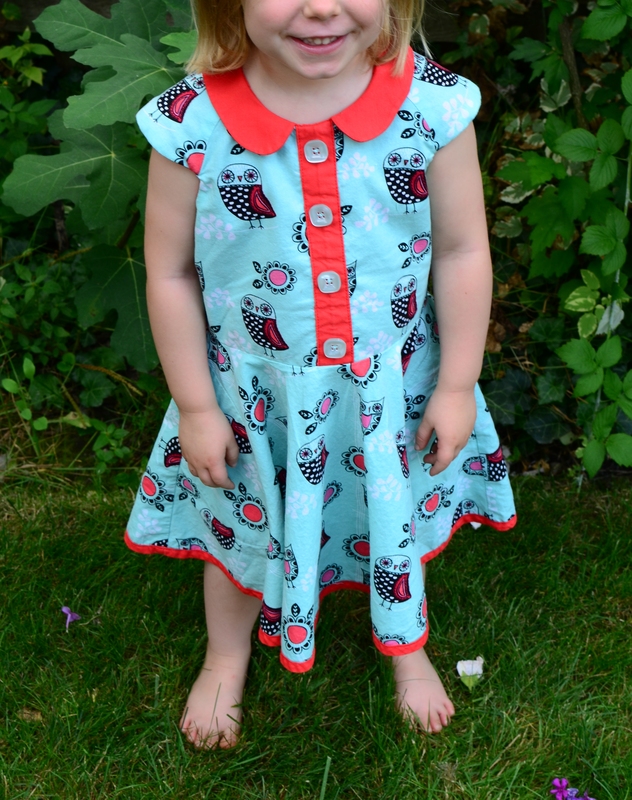 There’s a full or half circle skirt, a raglan or regular bodice, cap or short sleeves (or sleeveless, of course), different faux placket options, three different collars and three different pockets in there! And, the best thing about it, I think, is that you can mix and match sleeves and skirts from Compagnie M’s other patterns. That means you can use Lotta, Mara or Louisa parts with the Ileana to create just about anything. 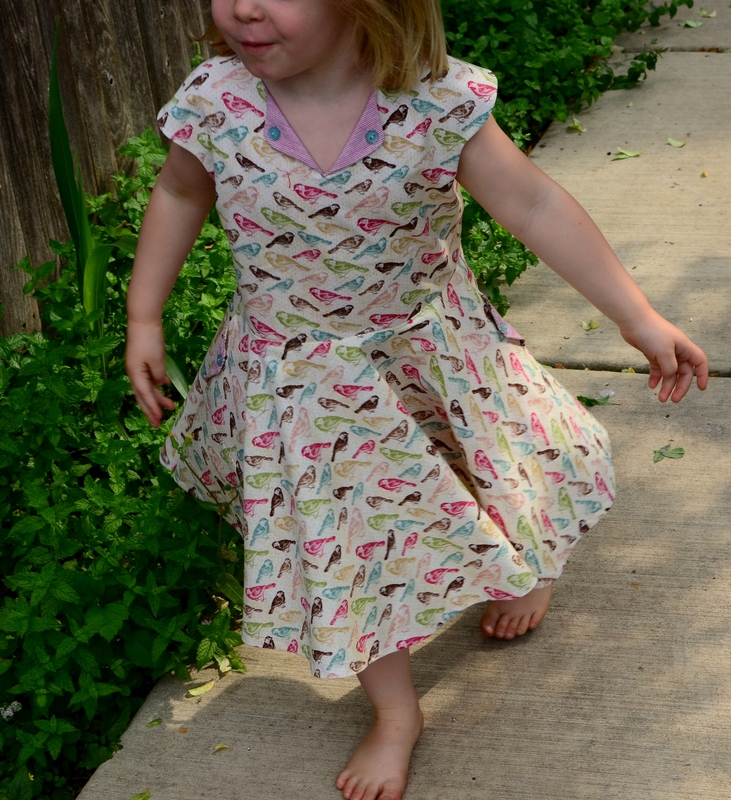 I’ve already made three of these dresses, one of which is a Lotta/Ileana hybrid (which I’ll show you later). Whoopeeeeee! 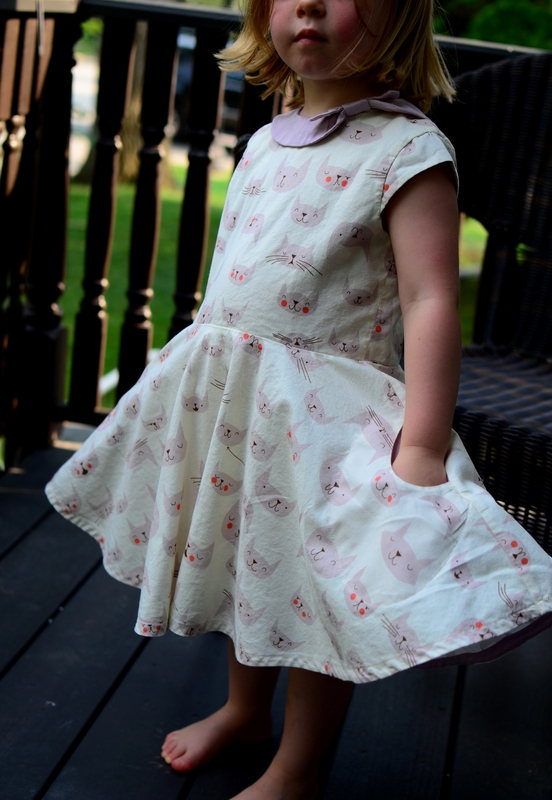 This solves some problems for me, as I’d like to make Lulu as many dresses as I make for her big sister Kiki, but her very strict “circle skirts only” policy makes it tricky to keep sewing without getting bored with just one style. On to Lulu’s Ileana #1 — which she loves so much, she slept in it the night she tried it on the first time just because she didn’t want to take it off. I hadn’t even gotten the buttons on yet! 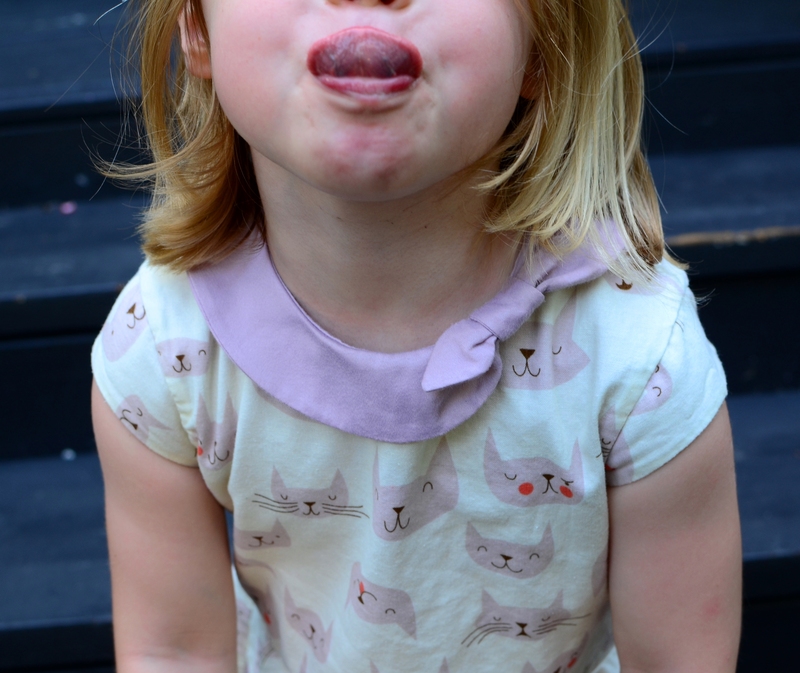 She also reserved it for the first day of preschool this week. 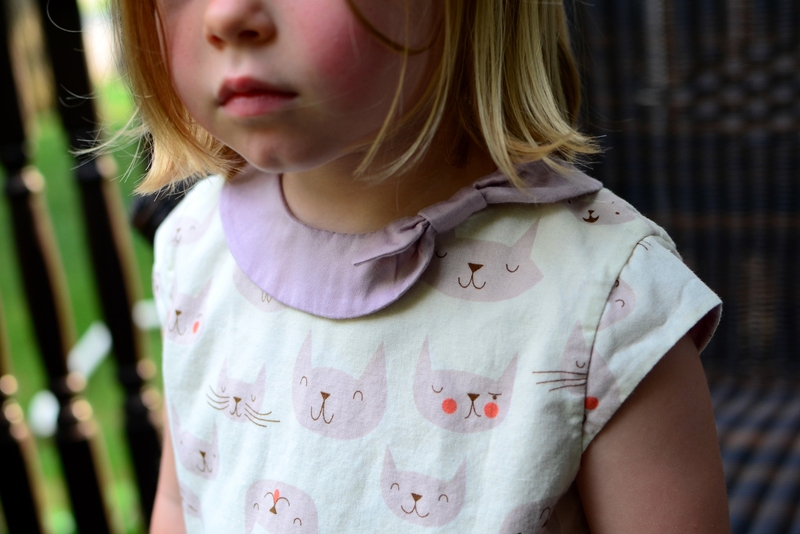 For this Ileana, I made a raglan bodice with regular raglan sleeves, the bodice length faux button placket, the round Peter Pan collar and the tear drop cutout pockets. 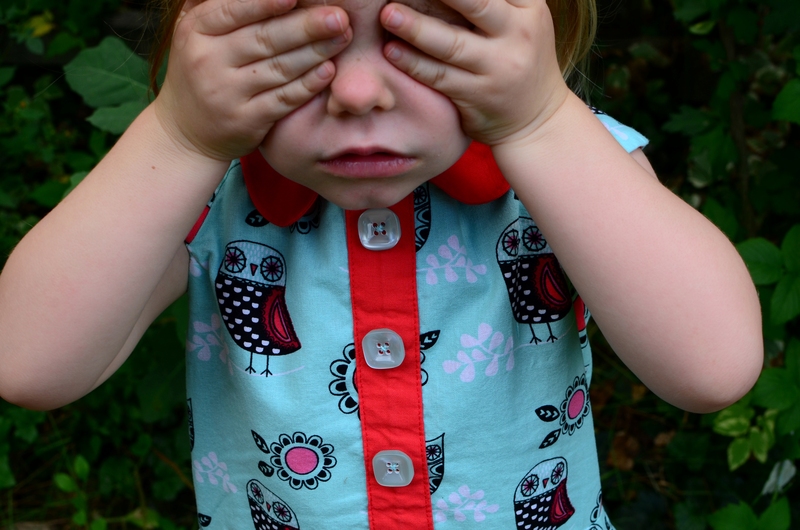 Even though Lulu’s chest measurement points toward a 4T, I made a 3T here, and the fit is just fine — not too big yet still roomy enough to grow. 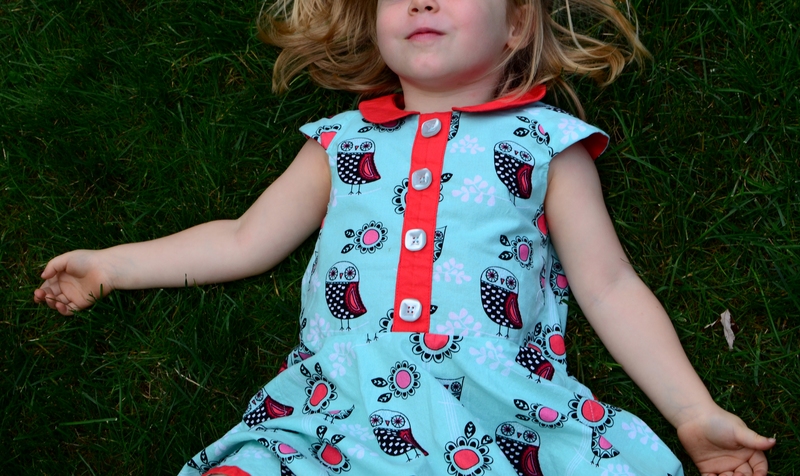 Lulu chose the fabric herself on a recent trip to Joann’s, and she now refers this dress as her “Owl Dress”. It’s quilting cotton, which works well for this pattern. I think it needs some structure, and the slightly heavier weight of the quilting cotton is perfect. The collar, placket, pocket detail and hem tape are all a solid red Kona cotton. The hem is finished with single fold bias tape, since it would be just about impossible to press up and hem a circle skirt. But when I was about half way through attaching the bias tape here (which takes a while, as the circle is pretty big), I realized I was accidentally sewing it on backwards, so that the tape would show on the outside, rather than on the inside of the skirt. I couldn’t face the prospect of taking it all off and starting again (especially after taking the time to make my own bias tape to match), so I decided to leave it as is and have the tape show on the outside. I think it turned out great this way! This pocket design is awesome, and surprisingly easy to do — even easier then invisible side seam pockets. I did make one change, which was to stitch around the entire perimeter of the pockets on the front of the skirt on the inside, so that they don’t flop around while twirling and won’t get all bunched up in the drier. This was a good move. 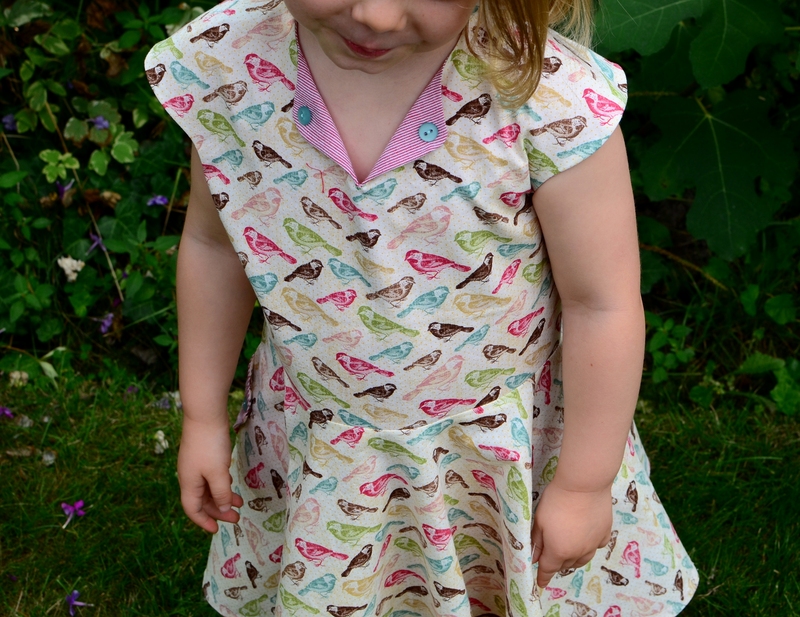 I did my best on the zipper pattern matching. I hadn’t done it in a while and had to consult my own blog post about it to remember just what to do. Haha! The only problem I had was turning the bodice right side out and getting it to press flat where the bodice meets the sleeves. I trimmed the seam allowance in there as much as I could, and it still doesn’t press perfectly smooth. But hey, let’s not obsess on the trivial. However, I do now know from recent experience that the regular bodice/cap sleeve option is easier and eliminates this problem, so I’ll probably stick with that plan in the future. And now, for the ultimate test — twirlability . . .
Stay tuned for Ileana #2 . . .